Thread: Are we designed or 'meant' to eat meat? Carnivores have a wide mouth opening in relation to their head size. This confers obvious advantages in developing the forces used in seizing, killing and dismembering prey. Facial musculature is reduced since these muscles would hinder a wide gape, and play no part in the animal's preparation of food for swallowing. In all mammalian carnivores, the jaw joint is a simple hinge joint lying in the same plane as the teeth. This type of joint is extremely stable and acts as the pivot point for the "lever arms" formed by the upper and lower jaws. The primary muscle used for operating the jaw in carnivores is the temporalis muscle. This muscle is so massive in carnivores that it accounts for most of the bulk of the sides of the head (when you pet a dog, you are petting its temporalis muscles). The "angle" of the mandible (lower jaw) in carnivores is small. This is because the muscles (masseter and pterygoids) that attach there are of minor importance in these animals. The lower jaw of carnivores cannot move forward, and has very limited side-to-side motion. When the jaw of a carnivore closes, the blade-shaped cheek molars slide past each other to give a slicing motion that is very effective for shearing meat off bone. The teeth of a carnivore are discretely spaced so as not to trap stringy debris. The incisors are short, pointed and prong-like and are used for grasping and shredding. The canines are greatly elongated and dagger-like for stabbing, tearing and killing prey. The molars (carnassials) are flattened and triangular with jagged edges such that they function like serrated-edged blades. Because of the hinge-type joint, when a carnivore closes its jaw, the cheek teeth come together in a back-to-front fashion giving a smooth cutting motion like the blades on a pair of shears. I read something similar to this recently. VERY good information. I've been using this with my mom who is on the verge of at least becoming a vegetarian. You are not required to complete the task of repairing the world, neither are you free to abstain from it. I agree with this article. I once was arguing with someone (a vegetarian at that) who had some sort of degree in biology and did not agree with this assessment. I was thinking to myself, what a waste of money on an education and subsequent degree if you cannot clearly agree to this. Someone then brought up, but carnivores and omnivores do not have eyes on the side of their head, that they are focused in a straight manner. I again thought to myself, haven't these people ever seen a snake before? 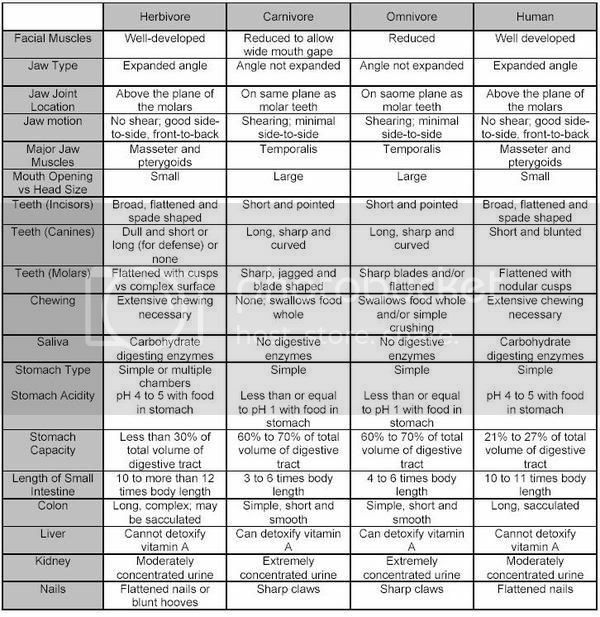 Although a human may not match every single possible characteristic of a typical herbivore, we share damn near every characteristic with an herbivore (as shown by the referenced article) whereas we share almost none with an omnivore, or carnivore. Humans are nothing more than behavioral omnivores as stated in that article. I almost fall out laughing when a person says that we have omnivorous canine teeth. Oh really? Our teeth resemble that of a dog? Dogs are omnivores and our teeth are nothing like theirs. In fact, the only animals humans could possibly dig into and chew raw are insects, just like any other herbivore could. Humans may have not had enough intelligence during our early stages of development to realize we are natural herbivores, and thus survived on plants, insects, and animal scraps left behind by true omnivores and carnivores. To me, it doesn't really make any difference whether humans are naturally omnivorous or vegan. The important point is that we can be healthy as vegans. I just love the summary! I agree. Not just healthy, but THE healthiest! (if it's done right). But I love these herbivore-carnivore-omnivore-human facts so we can show those who harp on about it being natural to eat meat, like WE are the abnormal ones, that actually, no, it's not, not for us humans. All the evidence for me points to veganism being THE most obviously natural way to be. I do accept, that when your food choices are severly limited, meat can be the only way to survive, but for the majority of us, we have a choice. Thank goodness for that. Vegans go all the way. Talking about mouth movement.. something worth noticing!! Consider herbivores animals like cows, Horses, deer, donkeys etc. Have you observed how these drink water?? They never put their tounge outside. They are capable of drinking water just using their mouth movement and don't need additional assistance from their tounge. On the other hand, consider carnivores like Lions, tigers, hyenas, dogs and cats. These drink fluids using a recursive tounge movement. They put their tounges outside lick the water, and the tounge goes in. The process is repeated and tounge goes in and out till the animal feels sufficient. Hence meat eating humans belonging to that category. They are to be classified that way. It is upto to each indivigual to decide if he wants to be a herbivore or a carnivore. Personally, I cannot imagine me drinking like carnivores. It seems disgusting for humans. I am hence proud to be a vegan. I suppose it depends aswell, how desparate the animals hunger is for mouth lubricant! Re: Did humans always eat meat? I have only been veg*n a couple of months now, and one of the debates that i find really interesting is whether or not humans are designed to eat meat. It seems to me that there is a lot of evidence that the human body was designed to digest plants, not meat, and that anatomically we're more like herbivores than carnivores. However I know that a lot of veg*ns disagree with this opinion. I'd be really interested to hear others opinions on this matter. Re: Are we designed to eat meat? Hi Griggsy, I just merged your thread with a similar, existing thread. I think we evolved from primarily herbivorous primates. However, from the reading I've done on human evolution, it seems our early ancestors (Australopithicines and such) were herbivores that would eat meat opportunistically. In other words, we'd eat meat when available but really didn't go after it as such. As much as some people want to picture man as a mighty hunter, we mostly got meat we scavenged or could easily overpower (grab that lizard!). So, humans and our early ancestors almost unquestionably ate meat, but it probably amounted to less than 5 percent of the total diet. Modren day omni doctors, scientists and historians arrogantly claim that "without the protein found in meat, our early ancestors' brains would not have developed to the points they are today." Whether humans are designed to eat meat or not, it does not justify the cruel, unnecessary conditions we treat animals! Couldn't agree more Tigerlily. Very apt! What I often remember when one of the cats is licking my nose (ow!) is that contrary to popular belief, cats do not have hairy tongues for grooming purposes. Those scratchy hairs are for cleaning the meat off the bones of their kills. If humans were natural carnivores they would have hairy tongues too, and not just sharp teeth! If it's not necessary to eat meat (which us vegans prove on a daily basis by merely existing, albeit mostly healthfully) then it's unnecessary to subscribe to animal suffering. Physical characteristics are our best evidence as to what we are meant to eat. Thus, although we think we are one and we act as if we are one, human beings are not natural carnivores. When we kill animals to eat them, they end up killing us because their flesh, which contains cholesterol and saturated fat, was never intended for human beings, who are natural herbivores. Where are the natural killing tools on our body? Why do we need it cooked to stop it from being poisonous? Why does it sit in our stomach longer than other foods? Why is it high in cholestrol? Why don't we have teeth like canines, felines and other carnivourous animals? of course I only say this when people tell me I'M unnatural, I don't like being a preachy vegan, it does more harm than good. I don't think that's true, I could be wrong, but I think it's only because it's not eaten 'fresh' that it needs to be cooked. Well, I think the truth is that we did evolve to eat more meat than our more markedly herbivorous primate ancestors. You can go back 15 million years to find a strongly frugivorous, herbivorous line. And now our closest relatives get 87-99% of their calories plants. But somewhere along the line we diverged. Our small intestines are longer and our colons shorter than those of our relatives who are designed to eat considerably more fiber. Also the total length of the GI tract is smaller in the human than in the apes. Nobody is sure when this change took place but some estimate it had to be prior to 160000 years ago. A short part (around 9%) of the last 15 million years. Although our guts changed, our digestive kinetics seem to have remained the same compared to our closest relatives. So although we are different, we are also still similar in this important way, which is very different from that of a carnivore. In the human, for some reason, energy needs increased while energy density also increased. This is different from the chimp (who eats mostly fruit and has a small body and a well-developed brain) and the gorilla (who eats mostly leaves and has a huge body and a not-as-well-developed brain but spends much more time eating than the chimp). Up to some percentage, animal foods are tolerated by the primate body. In the pre-human, more reliance on animal source foods for certain amino and fatty acids allowed for less reliance on plant foods for those particular dietary requirements. They also might have been important for child development, because on a very high fiber diet it may be difficult for children to take in enough energy and satisfy all their requirements. At least, that is what Katherine Milton says. It seems clear to me that we did adapt to lower fiber foods and this was well before agriculture so animal foods would have had to have played an important role. But the most important thing nowadays seems to me that we have the brains and the knowledge to make better choices. We are so lucky that we have these choices! 2.There does seem to be a trend of greater disease rates with lower fiber and higher animal food in the diet. 3. Eskimos are not longevity champs, in fact the only sources I can find shows that pre-1950s, lifespans exceeding 40 years were rare. Nowadays they might make it to 60. Evolution selects for reproductive success and not freedom from disease for 80-100 years (or more). We can surely make it to 20 on a diet comprised mostly of animals foods. But we may be more likely to make it to 80-100 without cancer, diabetes, heart disease, etc. on a well planned diet comprised solely of plant foods provided we take supplements for B12 and possibly D2. That's my position and I'm sticking to it. I agree with the ad... we WERE meant to eat meat. But not now - we have become independant and intellectual and KNOW that it is wrong to eat animal products. So the main catchcry 'Meat... we WERE meant to eat it' really is promoting veganism. Humans are naturally herbivores. It says so at Wikipedia. "Humans are often mistaken for omnivores, however they are naturally herbivores whom have become accustomed to the eating of meat for convenience of lifestyle. The fact that humans have been eating meat for the past several thousand years has led to some evolutionary changes in humans geneticism which favours the consumption of meat. Thus causing them to be developing into an omnivorous species. Given several thousand more years with current human diets, the transformation may have successfully occurred genetically, and humans would fit fully into the classification "omnivore"." Sorry if this is old news. It just gave me a warm glow inside when I read it. Maybe an all-vegan world is possible after all - through enforced genetic re-engineering? Re: Humans are naturally herbivores. It says so at Wikipedia. "The fact that humans have been eating meat for the past several thousand years has led to some evolutionary changes in humans geneticism which favours the consumption of meat." Thus causing them to be developing into an omnivorous species. I disagree in that too. Even if humans would have been 'accustomed to the eating of meat' (which I also disagree in: lots of diseases are associated with eating meat), that would mean that humans would have been 'omnivores' pr. definition... even if a human can eat something, it doesn't mean that he needs to or are 'designed to' eat it. Maybe an all-vegan world is possible after all - through enforced genetic re-engineering? we WERE meant to eat meat. No we were not. The teeth of carnivores are adapted to eat they flesh of their prey. At the front of the mouth the teeth are sharp and pointed. There are four which are longer than the others. These are called the canine teeth. I don't think nature/god/evolution has equipped humans with such a powerful canine teeth sturucture. 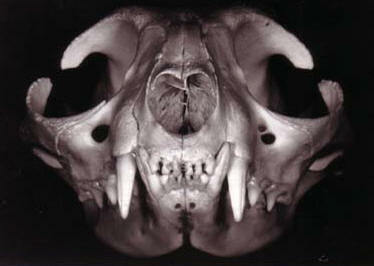 The typical canine teeth structure of a carnivore is shown below. Re: Are we designed or 'meant to' to eat meat? That looks like one of your old avatars, Kiran. The thing that is so unique about human beings is that we are not "meant" to do anything. For whatever reason we have an amazing freedom to do what we want. I think all this talk of what we were "meant" to do is irrelevant. It seems like a way for meat eaters to defend their meat eating, their way of "doing harm". Man has the intelligence to choose between different ways of eating the way that other animals cannot, and surely decades of healthy vegans have shown that man can choose to live without meat quite happily. It seems like a way for meat eaters to defend their meat eating, their way of "doing harm". I believe that we are naturally omnivorous, that meat would have made up a small percentage of our diets and that the choice to become a vegan is an ethical one. I concur with Marika5 (above). The devil is in the detail here - note especially the 'might' in the last sentence. Equally, one could propose: an omnivore could be expected to be an herbivore which shows some gastrointestinal tract adaptations to a carnivorous diet (convergent evolution is the principle I'm working by here). It's also disingenuous to say that 'carnivore gut structure is more primitive than herbivorous adaptations.' It is simpler simply due to the pressures of natural selection - when somethings works well it doesn't tend to change. Bears are more closely related to cats and dogs than humans. The comparison that needed to be drawn is between us and other primates. Any other is specious. Humanity's tool usage means we don't need carnivorous teeth and claws. There are many debatable points throughout the piece (and the table Korn posted; generalisations...) - I'm not going to go through all of them. Please note I am not attacking veganism - I think it is an admirable ethical stance - I am debating sloppy reasoning. I believe that we are naturally omnivorous, that meat would have made up a small percentage of our diets and that the choice to become a vegan is an ethical one. If meat 'would have' made up a small percentage of human diets (we know that both meat eating and non-meat eating cultures have existed for thousands of years), wouldn't that suggest that you believe that humans were, and not are natural omnivorous? "Produced or existing in nature; not artificial or manufactured"
"Existing in nature or created by the forces of nature, in contrast to production by man; not made, manufactured, or processed by humans"
If humans don't have carnivorous teeth and claws, and we need tools in order to kill animals, and man made tools definitely are within the definition of 'culture', and not 'nature', isn't the only logical conclusion (whether we at some point in history were natural omnivorous or not) that we are not natural omnivorous anymore? Human evolution started with Australopithecus Afarensis (3-4 million years ago) - and apparently, they were herbivores. 1-2 million years ago Homo Habilis apparently started to include meat in their diet. We know that today, hundreds of millions of people are not eating meat, and this has been going on for thousands of years. Our ancestors have had periods where most of them did not eat meat, periods where some/many/most of them ate a least some meat, and today, humans can 'catch', 'kill' and digest plants without tools, but in order to catch and kill animals, we are dependent tools that are 'manufactured' (read: not occurring in nature, but produced by humans = not within the definition of natural)... and therefore not natural omnivorous? Human anatomy is much more similar to herbivores than carnivores. Mixed diets of plants and animals promote heart disease, cancer, diabetes, osteoporosis, and every other major degenerative disease. Physical performance is superior on all-plant diets. The comparison that needed to be drawn is between us and other primates. Frankly, I don't think any comparison is needed at all, because even if someone would prove that some primates would eat other animals, or other members of their own species, that wouldn't mean that you or I should do the same. Plus, why look at another species - we could look at our own, and if even we should follow a philosophy saying that 'it's natural for us to eat what others living beings, similar to us are eating' why not look at humans, living today, and simply acknowledge that there are hundred of millions of humans who don't eat meat - they are more similar to us than primates, so if we need someone similar to us to back something up, look at all the vegetarian humans. They are living, today, they are humans, so all guesswork about what some prehistoric human ate millions of years ago isn't needed. Whatever we did or ate in the past, we know that we have developed into a species that can survive perfectly well without including any meat or other animal products in our diet, so my personal opinion is that we should ignore what some humans may or may not have been doing thousands or millions of years ago. That's what our ancestors, Homo Habilis did when they - unlike their ancestors, Australopithecus Afarensis - included meat in their diet. If we would have been 'designed to' eat meat (maybe our ancestors at some point were? ), we still need to face the fact that cosnuming meat is associated with a lot of health problems - and many environmental issues (with today's population). In another thread about the same topic, Vagetarian wrote that "In my opinion the most "natural" diet is the one that let's a person survive as long as possible in the environment where he/she lives with the resources of that environment" - which makes a lot of sense, but I'd add a few extra premises: one of them being health. 'As long as possible' isn't always good: I'd rather become 90 years old and have a healthy, happy life, than become 120 and spend the last 30 years in agony. But - it doesn't matter which of these criterions we look at: in both cases, avoiding meat is the best solution, and can a diet that makes humans live shorter and become more ill really be the natural solution? The fact that we don't have or need carnivorous teeth and claws (because we can make tools) doesn't mean that it's natural for us to use the tools we can make in order to kill. If both humans and animals are more healthy and happy without killing each other, why bother about what may or may not have been natural or necessary for human ancestors living under totally different conditions? thank you sincerely for your welcome and your comments. There are a few concerns you raise that I would elaborate upon. When I said we are naturally omnivorous, I meant over a time scale of millions of years - evolution is not a process that occurs quickly. We're an opportunistic species with a remarkable ability to adapt to our circumstances. Chimpanzees (our closest relatives on the planet today) utilise stalks of grass to 'fish' termites out of their mounds. The grass grows - it is a natural resource, but is used as a tool by the chimpanzees. By sitting at the termite mound and catching termites, it means that the chimpanzee expends less energy in amassing nutrients - in particular protein - than it would were it to have to forage over an area, which in turn means that it is more likely in the genealogical stakes to pass on its DNA: survival of the fittest. I believe that it's wooly thinking to try to link veganism to our biological ancestory. The firmest ground upon which vegans stand is ethical. Humanity knows enough about nutrition now to not have to rely on animals for protein or products. We don't have to deny where we come from to be where we are. While our ancestors may have been natural omnivorous, this doesn't imply that today's humans are. Scientist don't agree in what humans did or how they lived a few million years ago, or if all (vs. most, some) of our ancestors lived they way they did or ate what they did. Even if they know that some pre-humans ate eg. fish, this doesn't mean that all our ancestors did: Take a look at these findings, for example. My main point is that even if human ancestor may have eaten meat without all the health issues meat eaters experience today, this doesn't mean that humans living today are natural omnivorous, does it? We're an opportunistic species with a remarkable ability to adapt to our circumstances. ...and we don't have the claws etc. that animals 'designed to' eat meat have, so we obviously aren't naturally equipped to kill other animals (anymore). Since we are not, is it then natural for us to do so? Chimpanzees (our closest relatives on the planet today) utilise stalks of grass to 'fish' termites out of their mounds. The grass grows - it is a natural resource, but is used as a tool by the chimpanzees. Is it natural (or 'are we designed') to eat insects, just because we are capable of doing it? We don't need to look at termites, we can catch ants with our bare hands, but does this mean that people who think we should to everything are capable of, just because we are capable of doing it, suggests that our ancestor ate insects, or that it's natural for humans to eat termites or ants, or that we should do it? There is no link between 'capable of' and 'natural', but IMO there's a link between 'not capable of' an unnatural. By sitting at the termite mound and catching termites, it means that the chimpanzee expends less energy in amassing nutrients - in particular protein - than it would were it to have to forage over an area, which in turn means that it is more likely in the genealogical stakes to pass on its DNA: survival of the fittest. 1) I'm not a chimpanzee. 2) As we all know, getting enough protein without eating termites is not a problem - look here. Is it relevant that chimpanzees, who are not humans, are capable of eating termites? I'm a human, I can eat ants without using tools, but does that really tell me anything at all about what's natural for me - eg. that I'm natural omnivorous, or that humans are 'designed to' eat ants? Or to eat meat? A human hand is capable of catching an ant, but are we meant to eat ants? I don't think so. I don't think we are meant to make bombs either, in spite of the fact that we have the brains and tools to make them. Women have been suppressed by men throughout history - nobody is denying that - but this doesn't mean that it's natural to do it because that's 'where we're coming from'. We don't have to deny where we come from to be where we are. The word 'natural' can be confusing, because while a stone is considered natural, and a nuclear bomb is not, we can also say that it's 'natural' for a person in desperate need for food to do whatever he can to get some nutrients, and there have been many situations throughout history which may have 'forced' humans to kill in order to survive. If I lived 10,000 years ago, was in the middle if a hunger catastrophe, and had a family who was starving, maybe it would feel 'natural' to eg. eat insects, because the only other alternative was death. So, while humans may have learnt to kill and create tools in order to survive, because it was a natural reaction to a specific situation in their life at some point, this doesn't make it 'natural' to kill. There have been incidents of cannibalism among non-cannibals, and all these people involved in these situations may have died if some of them wouldn't have been eating some of the others, but that doesn't make us 'natural cannibals' - it only says something about what humans may do in a life/death emergency situation. Of course, a lot more people have been eating meat from non-human animals than from humans throughout history, but this only says something about how common/normal meat eating has been, and tells us nothing about being natural omnivorous or that we are meant to eat meat. "History is more or less bunk. " (Henry Ford). I wouldn't eat meat even if it could be proven that all other humans - living and dead - were meat eaters... I don't want to, I don't need to, and the animals certainly don't want to become food. Unlike lions, tigers and bears, I'm definitely not designed to kill animals, birds or fish. The idea of killing an animal feels totally un-natural to me. It doesn't feel like I'm 'meant to' do it, which is all I need to know - plus: by being a vegan - even if one would be the only one on the planet - in two million years from now, someone could look back and say that the first known case of humans living on a vegan diet was found two million years ago! There are loads of 'real' doctors in' our camp'. What is it with Benjamin Spock and John Robbins that makes them fanatics? I'm just saying that when I've cited them and quoted [John Robbins or Dr. Spock, for instance], people want to know why it wasn't the top story on ABC News. Instead the top story ends up being toxic spinach, and the newspeople conveniently downplay that the source of contamination was runoff from animal agriculture. The world isn't ready for vegans; it may be trendy to be a vegan, but it's too extreme a "lifestyle choice" for most people. And in truth, any progress we're making is "too little, too late;" the environment is going to hell in spite of stopgap measures like importing less bottled water from Fiji and filtering tap water instead. Life expectancy continues to rise, no matter what people eat. And last I looked, even the Bubonic Plague has only temporarily slowed world population growth. What you describe reminds a bit of how the US (and other) governments are elected: it's very hard to get a lot of support and media coverage if you represent a small political party, which means that people have to decide if they're going to give up their opinions and vote for a bigger party, or if they're going to be stubborn (in a positive sense) and keep believing in what they believe in. Lots of stuff that's 'big' now only caught interest by a small minority at some point. Rock. Interest in environmental issues. Internet. Christianity, Buddhism.... the list is long. The reason that vegan issues aren't the top stories in media is because media is controlled both by the desire to get a lot of viewers/readers, and because the representation of vegans working in media probably is the same as in the rest of the world. Vegan doctors are fringey fanatics because they're not the top stories on ABC news? Maybe I just don't understand what you are trying to say. Back to the request for a 'mianstream paper' - are you looking or stuff like this (see below)? It is the position of the American Dietetic Association and Dietitians of Canada that appropriately planned vegetarian diets are healthful, nutritionally adequate, and provide health benefits in the prevention and treatment of certain diseases. Approximately 2.5% of adults in the United States and 4% of adults in Canada follow vegetarian diets. A vegetarian diet is defined as one that does not include meat, fish, or fowl. Interest in vegetarianism appears to be increasing, with many restaurants and college foodservices offering vegetarian meals routinely. Substantial growth in sales of foods attractive to vegetarians has occurred and these foods appear in many supermarkets. This position paper reviews the current scientific data related to key nutrients for vegetarians including protein, iron, zinc, calcium, vitamin D, riboflavin, vitamin B-12, vitamin A, n-3 fatty acids, and iodine. A vegetarian, including vegan, diet can meet current recommendations for all of these nutrients. In some cases, use of fortified foods or supplements can be helpful in meeting recommendations for individual nutrients. Well-planned vegan and other types of vegetarian diets are appropriate for all stages of the life-cycle including during pregnancy, lactation, infancy, childhood, and adolescence. Vegetarian diets offer a number of nutritional benefits including lower levels of saturated fat, cholesterol, and animal protein as well as higher levels of carbohydrates, fibre, magnesium, potassium, folate, antioxidants such as vitamins C and E, and phytochemicals. Vegetarians have been reported to have lower body mass indices than non-vegetarians, as well as lower rates of death from ischemic heart disease, lower blood cholesterol levels, lower blood pressure, and lower rates of hypertension, type 2 diabetes, and prostate and colon cancer. While a number of federally funded and institutional feeding programs can accommodate vegetarians, few have foods suitable for vegans at this time. Because of the variability of dietary practices among vegetarians, individual assessment of dietary intakes of vegetarians is required. Dietetics professionals have a responsibility to support and encourage those who express an interest in consuming a vegetarian diet. They can play key roles in educating vegetarian clients about food sources of specific nutrients, food purchase and preparation, and any dietary modifications that may be necessary to meet individual needs. Menu planning for vegetarians can be simplified by use of a food guide that specifies food groups and serving sizes. We have an entire thread on Dr. Mercola's antics here. Frank Language I'm sorry for you that see us all as weird, it must be terribly hard for being a vegan as you have such a low opinion of vegans/veganism. I see 2 real, bona-fide, medical doctors quite regularly who would love for all their patients to become vegans. They are impressed at my low blood pressure and high levels of iron and b-vits, even though I am over my ideal weight. They are not 'flaky' vegans but they see the 'diet' part of veganism as being the optimal way of eating - if done properly of course with a good nutritional balance . Now, I cited Dr. Mercola because he's a bigger quack than most--and therefore an easy target. To address cobweb's comment: I'm sorry if you see my remarks as self-deprecating; I'm really parroting the way "normal" people see vegans. (The people who "don't eat anything.") I also see doctors who congratulate me for lowering my cholesterol so radically in such a short period of time, and for losing weight, although they'd never dream of giving up dairy products, which my GP insists are "a good source of protein and calcium." Since I'm not ache-and-pain-free, no one who knows me feels my lifestyle is worth trying. And most people I've ever met say, "I could never be a vegan because..." [fill in the blank.] It's too extreme for most people, that's all--no right or wrong--and the "step-on-a-crack, break-your-mother's-back" vegans are a real turnoff to "normal" people, where their guidelines for living start looking like superstition. I've been accused more than once of veganism being my "religion." In my opinion nothing was either designed or 'meant' to do anything, otherwise we would all have a purpose and an overall goal - I suppose this constitutes a religious comment but thats the fault of the thread title. Thanks, but over a third of those hyperlinks on that link merely link back to a different page of the same site! That's like giving yourself as a reference on your resume. The other "facts" are addressed well by the last link I give in our fluoride thread. Any further discussion on fluoride should probably be carried over to there. Also, I think I kind of get your point now, at least better than before, that people tend to lump us together with freegans, extremists, etc. But it doesn't matter what other people think of us, what matters is how we think about ourselves. I hope you feel better and have less aches and pain. Since I'm not ache-and-pain-free, no one who knows me feels my lifestyle is worth trying. Although many (non-vegan) doctors recommend people eg. with arthritis staying away from animal products, they misunderstood something very basic if they think that veganism is a cure-all diet for all kinds pains and ahce. 'The vegan lifestyle isn't worth trying unless it cures all kinds of ache and pain'... Never heard that one. You keep posting quotes from most people as if you agree with them... wouldn't it better if - if YOU think veganism is 'too extreme' for most people - that you explain us why you think so? And, if you are only referring to that they assume that it's too extreme for them (which they of course do, based on how media presents veganism etc) please write that you think they believe it's too extreme for them. Eating vegan isn't more extreme than eating a standard diet, but it's less normal - simply because there are less vegans than non-vegans. I don't even think it's particularly true nowadays, lots of people are leaning more towards veganism, it's becoming a lot more 'mainstream' (thank goodness). My father had crippling Gout, took pills still had it, stoped eating all meat and hay no Gout and no pills. His docktor had never neard of such a thing in all his years as a GP. Not eating meat is a fact in his Gout free life now. My father that is not his GP. As for should we or shouldn't we? we can be lasy and will eat what ever is closest to us and takes the least enagy to get untill we get realy realy nafft off with eating it and go and get something els, untill we became Agreculturilists ( not that long aog ) and dominated our environment and stoped the need to be GATHERERS and hunters. The closest beeing to us is the Gorilla and if it weren't for some of our speeces then they wouldn't be dooing to badly, as Vegans. DON'T BEEMOAN THE DARKNESS LIGHT A CANDLE AND SHOW THE WAY. Most people with gout are just told to "limit" the amount of meat they eat, or the kinds of meat. Gout is a form of arthritis (sometimes called "gouty arthritis") caused by the formation of uric acid crystals in the joints. Sufferers are told to avoid foods high in purines (a lot of which are meat and animal products) but never told they'd feel better if they abstained from all meat. Congratulations to your father that he found the way! DON'T BEEMOAN THE DARK. LIGHT A CANDLE AND SHOW THE WAY. i take issue with this black and white argumentation. the basic premise here seems to be, if we're omnivore, we should eat an omnivore diet, but if we're herbivore, an herbivorous diet is what we should consume. these, in my opinion, supersede.